A friend and I have started a tradition of going out together to get all of our back-to-school supplies from the school supply list in one fell swoop, and then congratulating each other on a job well done with a lunch date or an afternoon matinee. It makes it a fun way to do an otherwise dull, and sometimes frustrating, task of finding the specifics we need. Two sets of eyes are better than one, right? However, after that trip, we're not *really* done as there are still six other essentials we need to get beyond the specific required items on the supply list. These items make a big difference in making your life easier and making your kids' life easier during the school year. Plus this is where you get to have a little fun in choosing colours and brands that you and your child like so it's fun to get them involved in this shopping adventure! *Note: there are affiliate links in this post that, if you click on them and place any orders, I *may* receive a very small commission which goes directly back into maintaining this website. Your support is greatly appreciated! First up, lunch bags! There are an overwhelming number of choices out there and I admit to standing in the middle of a lunch bag section of a store completely flummoxed. In the end, last year we decided on this style , on the advice of a friend, and we loved it (we didn't use this brand so I can't speak to its quality but I see them readily available in Staples). This style is especially great for grade primary kids though because you can put their recess in the bottom compartment, their lunch in the top and then use the pocket for any milk money or utensils. It makes it easy for them to remember when to eat what, and you can be confident they won't eat their full lunch at recess if you explain how it works to them. And of course you need lunch containers to go in those lunch bags. Another friend recommended these Rubbermaid LunchBlox and they are fantastic! They have various sizes such as small ones for dips, and full sandwich or entree sized ones, and they're pretty easy for kids to get the lids on and off of. Plus they come with these nifty lightweight ice blocks that snap right onto the containers to keep the food cool. My husband and I have actually started to use them for our leftovers and our own lunches and bought another set of them this year to add to our collection as there are always some in use. A lot of the local school classrooms can be very warm and dry in the fall and spring months, plus they've got gym class a few days a week so a good water bottle easy for them to refill on their own is essential. We are big fans of the Camelbak Eddys for kids. They have fun designs, they're easy for kids to refill, and easy for us to clean. I've also heard Contigo bottles are really good as well. This is probably the toughest decision. There are so many varieties and styles out there that I am still searching for the best one myself. The bag pictured is the style we have, but not the same brand. The advice I can offer is to try to find a decent quality one that has enough room for the lunch bag you've chosen, plus an extra sweater, and homework, a strong zipper on it, and at least one outside deep pocket for a water bottle (or enough room to tuck it inside), and kids always seem to like a few other random pockets for, you know, storing their playground rock collection (or is that just my kid??). As for design, ideally it's something that might last over a few years (so a colour or pattern over a trendy character), however so far we are working on a one school year per backpack record so unless you find one that will make it through a few years, then the trend level (aka kid approval of the character) isn't as important. I'd also suggest a reinforced bottom on the bag. When kids get to school they often drop their bags on the asphalt playground and go play till school starts. If they go on a bus they usually drop their bag on the road while they wait. The bottom of that bag get s lot of wear and tear so try to find one that can withstand it. Finally, water proof or resistant is another bonus to watch for to keep the gear inside nice and dry during our climate's rain and snow. Most kids have this on their supply list, but it's still an item that you usually have some creative control over. The one pictured is the same brand we got last year and a similar shoe. Sneakers are a back-to-school essential where it's nice to pick a colour or character that your kid loves as you know they're not likely going to be reusing them for years, but also make sure that it's a good quality shoe. I was shocked when my daughter brought home her indoor sneakers last June and they were in really rough shape. The velcro was shot, there were worn parts all over it, and they were way dirtier than I thought. I had figured they'd still be in good shape as they never went outside, however once I thought about it I realized they are wearing these shoes all day, every day, for ten months, along with gym a few times a week. That's more than she used to wear her regular sneakers before she started school so the shoes actually held up well for that much use! Try to find something that's good quality, fits comfortably, good for gym class, and, preferably, doesn't make any noise and limited lights. Last year Miss M fell in love with sneakers that, when you clicked the toes together, make a fairy twinkling sound AND lit up (and seemed to scatter glitter with almost every step). As cute as they were, I nixed the idea as I figured the teacher might not appreciate hearing Tinkerbell chimes and fairy dust every time Miss M went to the bathroom or walked down the hall. We did end up compromising with a very sparkly shoe with maybe too-bright-lights, like the one in the photo (sorry Mrs. S and Mrs. B!). And lastly, the most important back-to-school essential not on the supply list - labels! DO NOT send your kid to school (or day care) without labelling everything they take (even their backpack and lunch bag!) or your monthly dive into the overflowing lost and found bin at school will be much more challenging. Mabel's Labels was another friend recommendation (thank goodness for experienced parent friends!) and I grabbed a pack during back-to-school shopping last year on her advice. I was really pleased with how this brand held up - in fact, the ones on her lunch containers still look brand new after, what 200?, washes last year. The ones in her clothes also survived many washes and still look perfect. I grabbed a second pack this year, plus another for her brother for his preschool gear. Plus they have free and quick shipping in Canada (which is good as the local stores sell out quickly this time of year). You can get the labels pre-printed with their info right on it, or fill it in yourself with a permanent marker. A couple really useful ones they also have, besides the basics, are tags for backpacks, allergy alert stickers and shoe labels. I really love the shoe ones. They go on flat so the kids don't feel them at all but it makes it easy to identify their own, especially when there's a jumble of boots or shoes together outside a classroom. 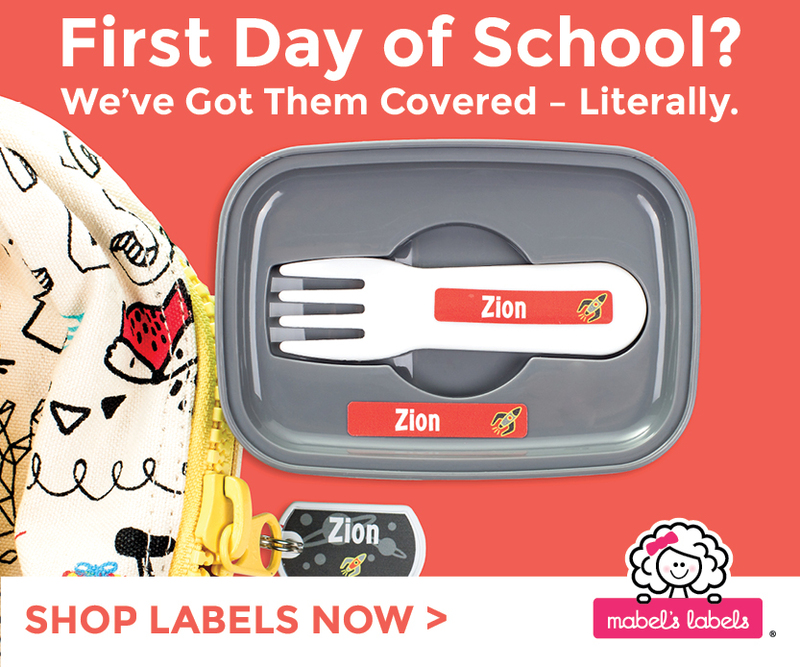 Note: I'm pleased to now be an affiliate for Mabel's Labels products so if you're planning to order any labels at all (free shipping in Canada!) I'd appreciate if you would consider using the affiliate link in one of the images for your order - any commission I make from them goes directly back into keeping my website running! Do you have any tips or tricks to add to this? Any brands you would recommend? How Does a Parent Prepare for Grade Primary?